Tall and skinny, Cap Reef (to the locals) is less than 15 miles east to west but nearly 100 miles north to south. And the spine of that long stretch is the amazing Waterpocket Fold. 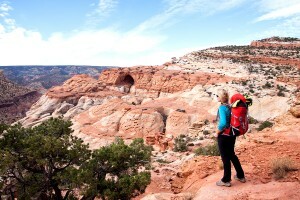 The immediate area around and including Capitol Reef has been a homeland to people for thousands of years. The Fremont Culture, archaic hunters and gatherers migrated through the canyons. Petroglyphs etched in rock walls and painted pictographs remain as sacred remnants of the ancient Indians' saga. Anthropomorphic (human-like) figures usually have trapezoidal shaped bodies and are often elaborately decorated with headdresses, ear bobs and necklaces. A wide variety of zoomorphic (animal-like) figures include bighorn sheep, deer, dogs, birds, snakes and lizards. Designs may have recorded religious or mythological events, migrations, hunting trips, resource locations, travel routes, celestial information and other important knowledge. Explorers, Mormon pioneers, arrived in the 1800s, settling in what is now the Fruita Rural Historic District. They planted and nurtured orchards of apples, pears, and peaches. Today, the orchards are managed to preserve their historic character and are watered with an irrigation system essentially in original condition. Visitors can pick and eat fruit from the orchards in season and purchase both fruits and nuts. 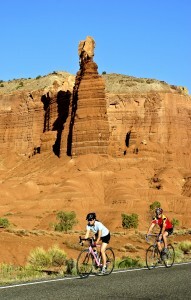 The Waterpocket Fold is the geology rock star (no pun intended) of Capitol Reef National Park. A nearly 100-mile long warp in the Earth's crust, the Waterpocket Fold is a classic monocline, a "step-up" in the rock layers. The layers on the west side of the Waterpocket Fold have been lifted more than 7,000 feet higher than the layers on the east. Major folds are almost always associated with underlying faults. The Waterpocket Fold formed between 50 and 70 million years ago when a major mountain building event in western North America, the Laramide Orogeny, reactivated an ancient buried fault. When the fault moved, the overlying rock layers were draped above the fault and formed a monocline. To see it is to be amazed! What to do. For the kids, Cap Reef has a free Junior Geologist Program offered Memorial Day to Labor Day. They'll discover geology, the formation of the Waterpocket Fold, colorful rock layers, and the effects of erosion. When activities are completed, they'll earn a certificate and patch. The Family Fun Pack Fun is a backpack full of activities, games and materials loaned out free at the visitor center or the Ripple Rock Nature Center. Inside are pioneer games, tools to read a contour map, identify night constellations and improve bird-watching skills. Educational fun and games. Bring your hiking boots! 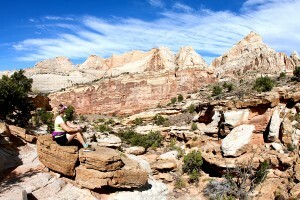 In the Fruita area alone, there are fifteen marked day hike trails located along Utah Highway 24 and the Scenic Drive. 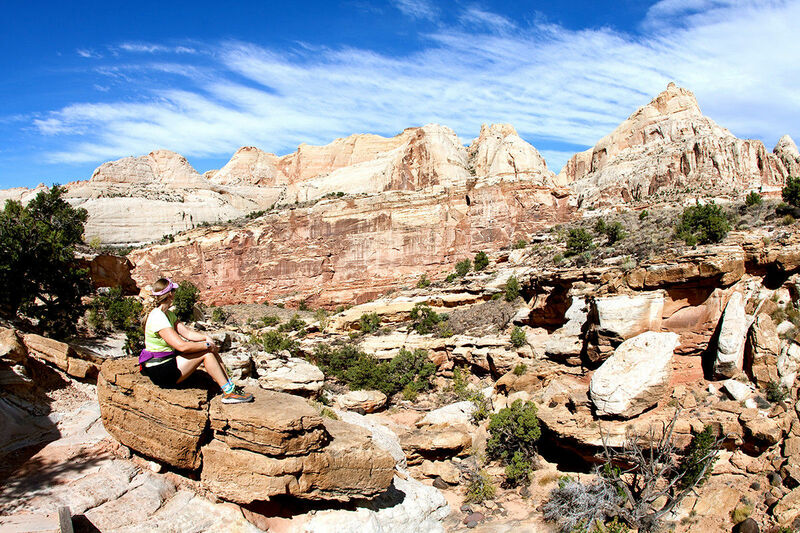 These trails offer the hiker a wide variety of options, from easy strolls along smooth paths over level ground to strenuous hikes involving steep climbs over uneven terrain near cliff edges. 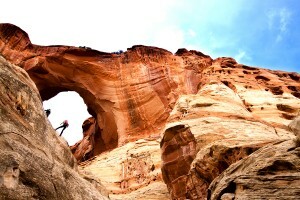 Hikes may take you deep into a narrow gorge, to the top of high cliffs for a bird's eye view of the surrounding area, under a natural stone arch, to historic inscriptions. Round trip distances vary in length from less than 0.25 miles to 10 miles. All trails are well-marked with signs at the trailhead and at trail junctions and by rock cairns along the way. Want more than a stroll through the park? 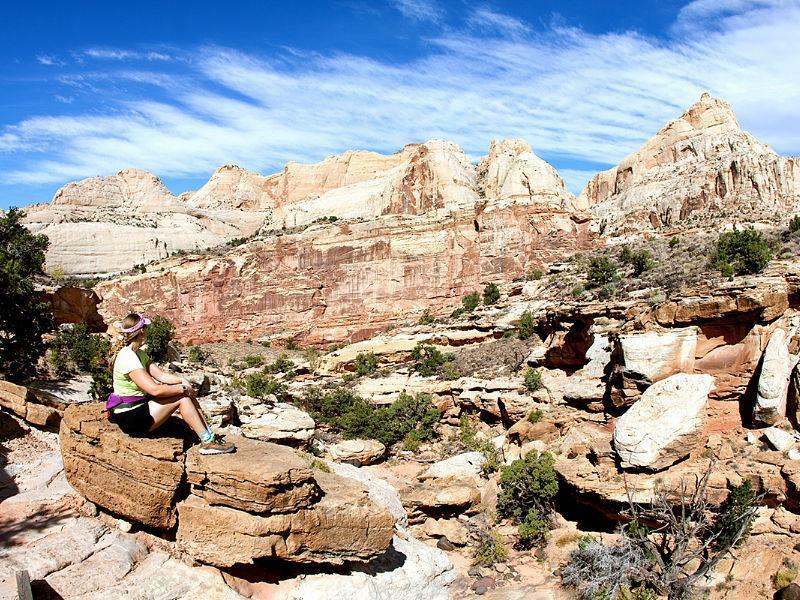 Capitol Reef has some of Utah's best options for serious backpackers and those who enjoy exploring remote areas. Marked hiking routes lead into narrow, twisting gorges and slot canyons and to spectacular viewpoints high atop the Waterpocket Fold. Popular backcountry hikes in the southern section of the park include Upper and Lower Muley Twist Canyons and Halls Creek. 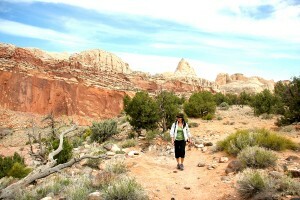 Backcountry hiking opportunities also exist in the Cathedral Valley area in the remote northern part of the park. The Backcountry. 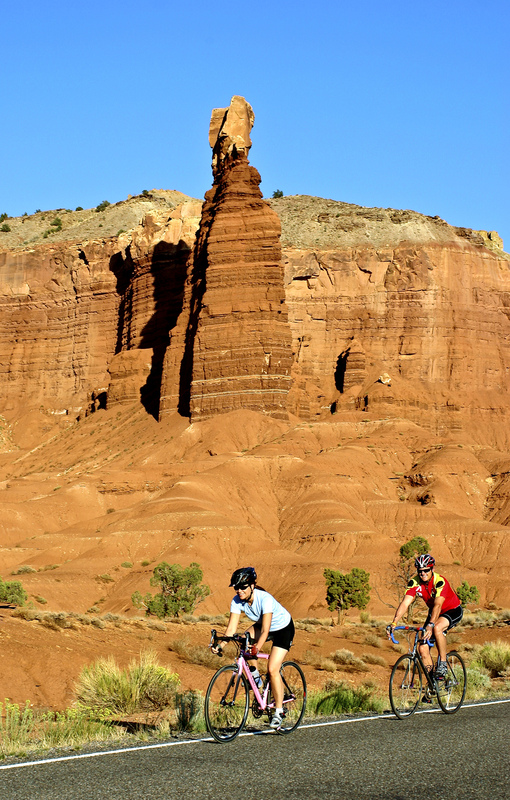 Although not as well known for canyoneering as other Utah locations, the quality of several routes in Capitol Reef is superb. 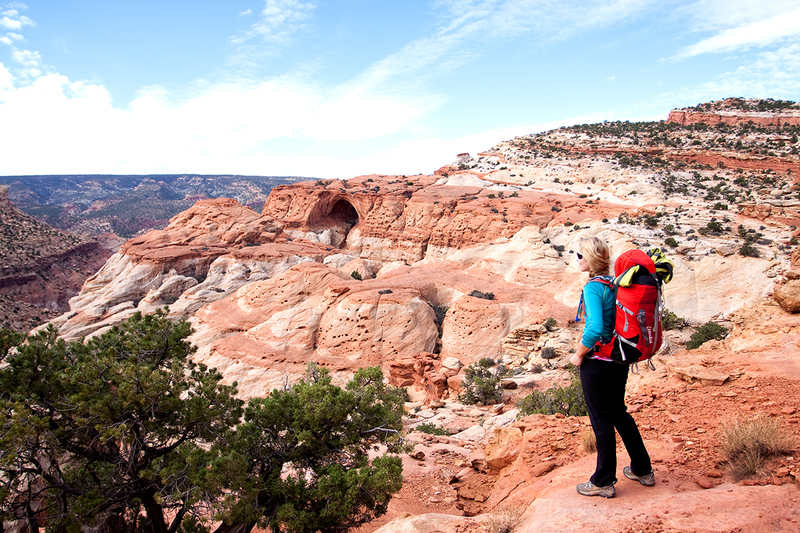 One is the popular hike up to Cassidy Arch. Most visitors make the trek up, view and photograph the spectacular structure and return down the trail to the valley floor. Lucky adventurers can enlist the services of Redrock Adventure Guides in Torrey to do several rappels down the vertical you climbed. Take your time on the first drop because the view of Cassidy Arch from this vantage is like no other. But more great ones follow. Horseback trips into remote areas of the park are another quality experience here. Backcounty Outfitters in Torrey can take you there.